If we prescribe to the idea that a picture says a thousand words; then it would follow that an esoteric picture would say a thousand different words to a thousand different people. Depending on the level of esoteric understanding the richness and depths that may be appreciated. Knowledge, contemplation and imagination do exponentially change and multiply those original thousand words. To so many words; the end of no words needed. I shall mention that I personally take little credit on the making of P5. Such work was created through a process taking many years, which I shall only comment as not fully understanding. What originally seemed as a dreamy type of logic making sense for some unknown reason finds its reason much later in life. We know that a symbol reveals and conceals, esoteric art maybe seen as a collection and languages of symbols. A person who speaks multiple languages can experience making sense of what may seem absurd to another. 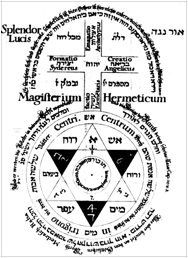 Symbols in occultism much the same way are telling of many things. In contrast to an esoteric lecture, esoteric art is like music to the eyes and much more powerful if we consider its unconscious effect. The P5 occurred over a period of 7 years and 9 months of research and development including the making of the 5 copper plates and its many proofs. What can be said regarding a work of art and esoteric art in particular? Well I shall regard the audience; and obviously provide no interpretation but only point out some elements for those who have ears may listen. 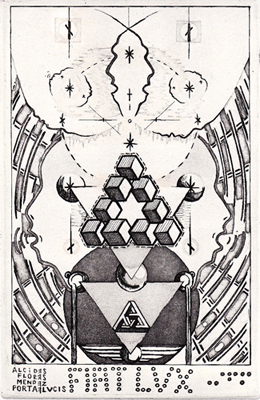 Through the five plates we see a relationship between a sphere of light and a sphere of darkness that incrementally move towards each other then combine, overlap and begin to separate. 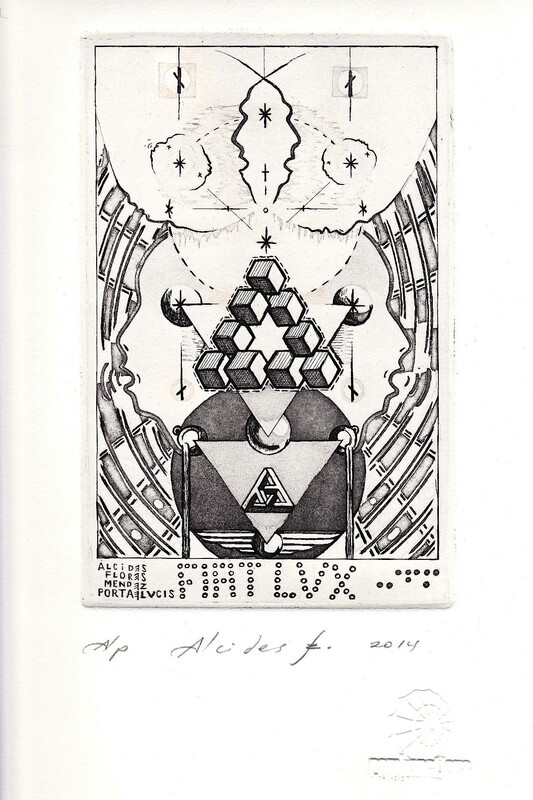 The sphere of light emerges from bellow in Plate 1 and begins to merge with that of darkness in Plate 2 forming a vesica piscis both in the second and fourth plates. 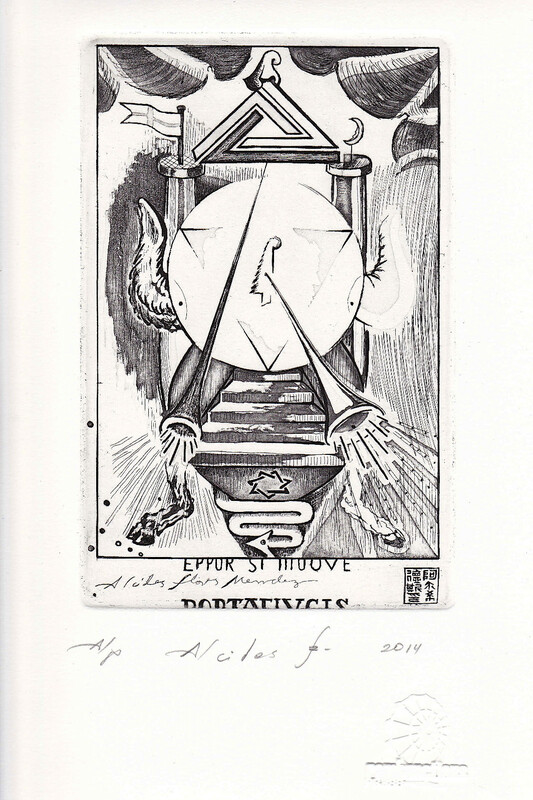 The third plate the spheres eclipse as the sphere of light totally covers that of darkness. 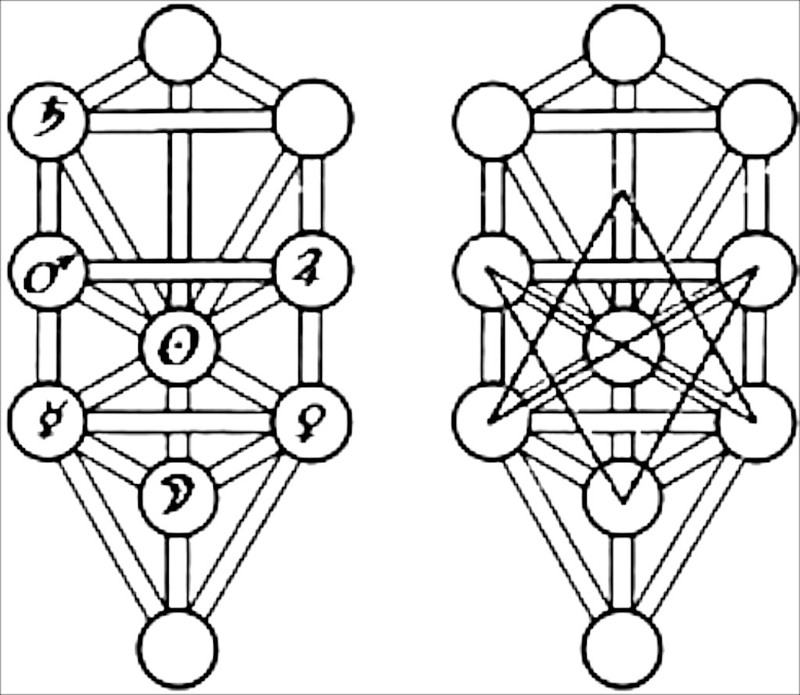 The kabalistic tree of life dynamically aligns and contextualizes elements in position across the plates. 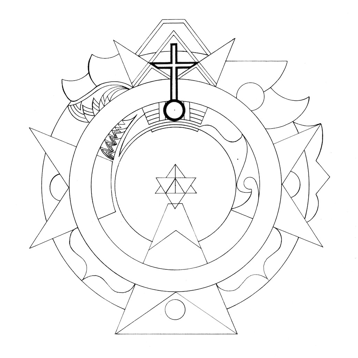 Overlapping its meaning and adding further complexity. Not to be taken literally but as means of interpretation as found applicable. 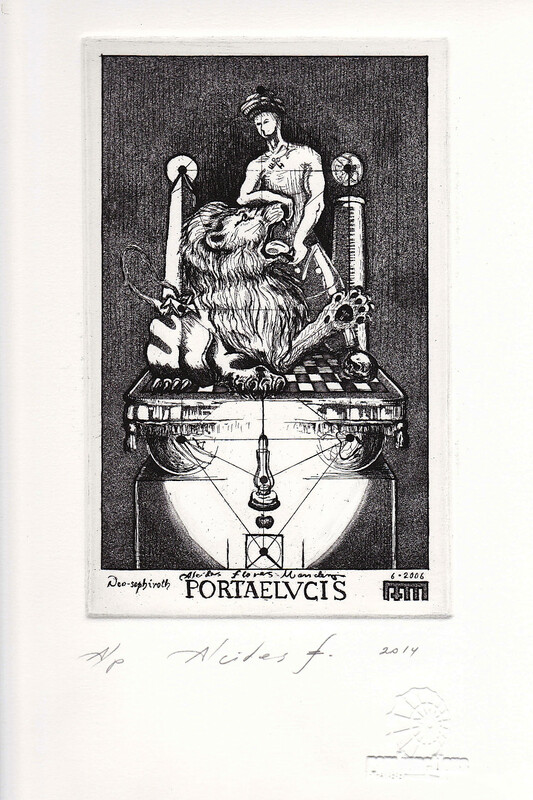 Plate 1 the enlightenment has begun as the lamp of Diogenes of Sinope who died in Corinth 323 BC begins to rise above an apple. 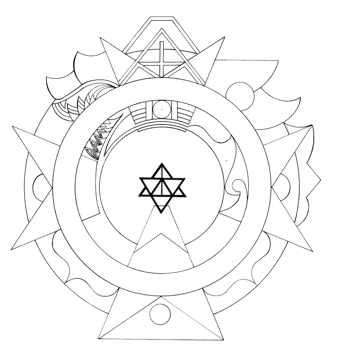 Plate 2 can be seen on the side and upside down with the protagonist at the base and at the godhead. 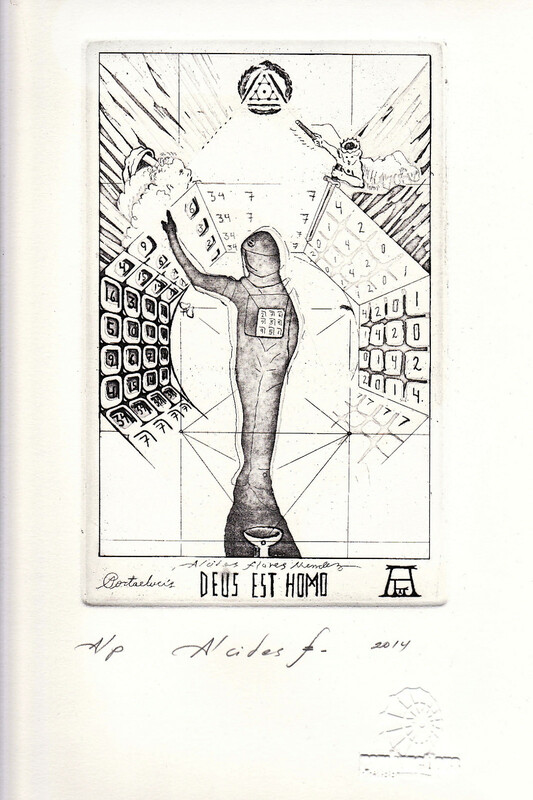 Plate 2 uses an image of an old man in bed taken from Stanly Kubrick 2001: A Space Odyssey 1968 and Plate 3 of the astronaut seen in an octahedron. 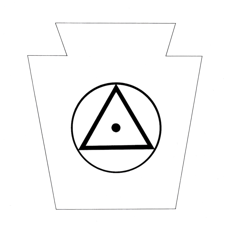 There is a pentagon above the octagon and in addition a triangle or "Tetractys" above the pentagon with an encompassing Ouroboros surrounding the triangle. The AFM sign is replaced by the mark given to me as a Mark Master Mason. 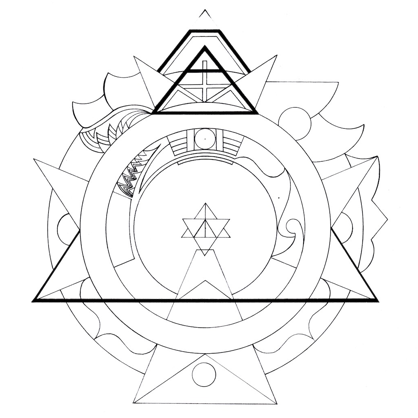 Plate 5 A world of spheres, a new universe a soul within a soul an impossible triangle a new light is created. 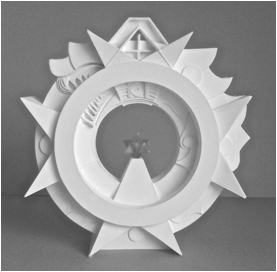 Fiat Lux "let there be light" correspondingly the AFM is written in brail as if for the blind to see. 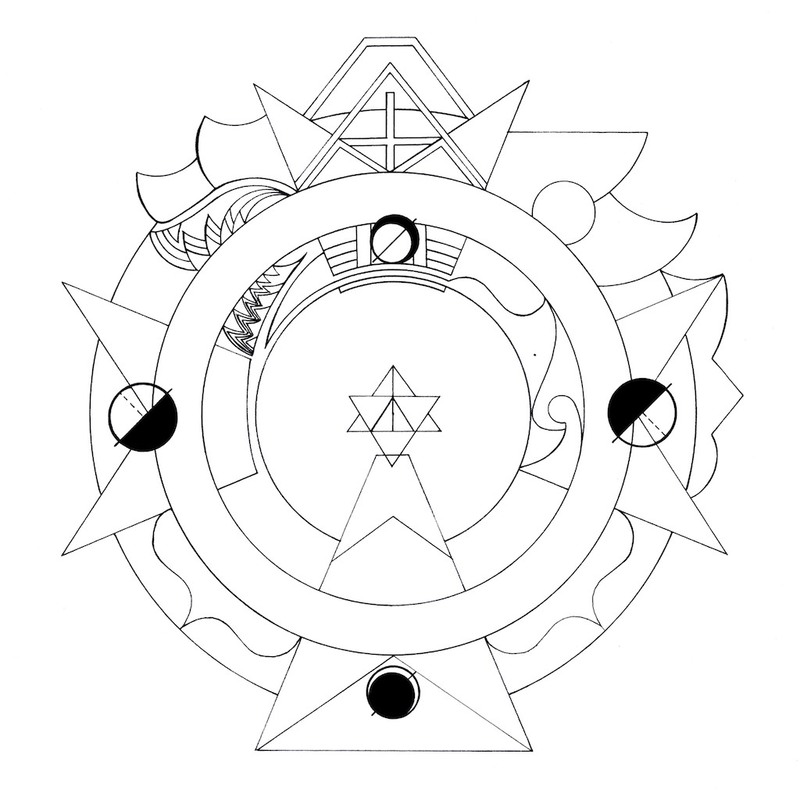 Arcana 1. secrets or mysteries. 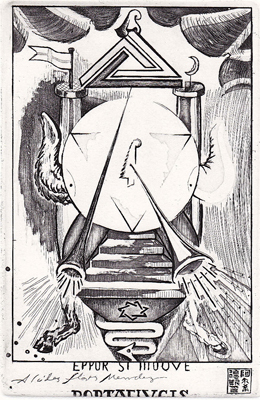 2. either of the two groups of cards in a tarot pack: the twenty-two trumps (the major arcana ) and the fifty-six suit cards (the minor arcana ). 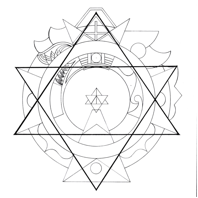 The figure emblematic of the Tetragrammaton or sacred name of four letters, 1+2+3+4=10. Pythagoreans. Some of the symbols and ides that compose the “O” sculpture could be encompassed under the banner of Poetic Symbolism. It is within that context that we can begin to unpack some of the deeper meaning bound to represent different things to different people and be subject to interpretation. Non the less its various meanings are hidden and displayed only in part so that no superficial or partial knowledge be sufficient to reveal its secrets. The “O” sculpture holds in its make up, many symbols perhaps religious in nature jet it is not a work of superstition. 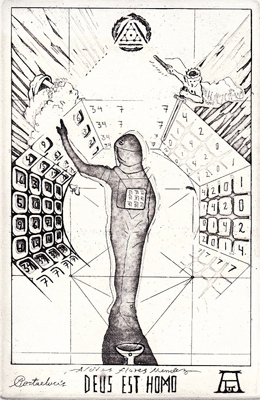 But rather an exercise that spans a long journey in the study of say esoteric ideas, symbols, numbers, myths etc. It finds composition in order and entwines many into a whole; like pieces of a puzzle that form one integrated bigger picture. 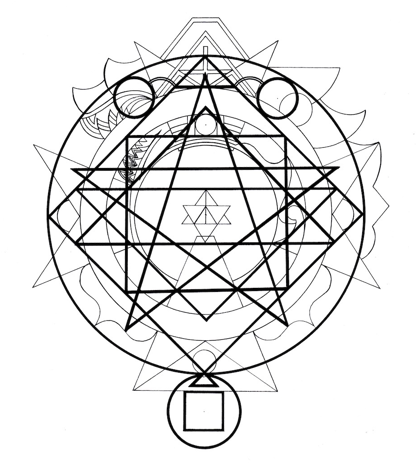 When we think of esoteric meaning we rarely think of our selves in contribution to the creation of the meaning. That is to also say that we take relevance of those elements that are of particular interest or relation to our selves. In most instances our interpretations may be far removed from their original meaning and jet meaningful to us. In that process renewing and revitalising knowledge as it develops within our selves. The “O” sculpture should perhaps be initially thought of in individualistic terms; that is meaning many things in isolation. Then two meanings combined and so on thus revealing and concealing information as per the tradition. Tangents of observation present vastly different stories and to that purpose the sculpture as it did for me may serve as a tool for reflection and introspection; in the knowing of oneself through the study and contemplation of the inner light of personal creative and subjective meaning. The “O” sculpture could be at one level of interpretation: a freeze frame, a snap shot, an unmoving representation of a moving and dynamic ever-changing cyclical esoteric motion. A metaphor for everything; a comparative and physical reduction as it is when comparing the “O” sculpture to a stopped watch. Its purpose is that of a mechanism that normally moves but the sculpture does not instead it is everything around it that does. as a symbolic attempt to make time stand still as we look at it, as we try and comprehend it, as we try to make it our own. It pauses time into a peaceful silence were we are free and in control of it as we may by defining it in our minds according to our chosen will. Yet the sculpture remains still as all other things move around. People move, the planets move, time itself moves respectively one second per second, as it may seem if you wish to look at it that way. Which is a common way to do so and a most practical intellectual construct at that. A different way to think of time is rather ironic, profound and if it may be said deeply esoteric. Time perhaps as the only thing that remains without change, unchanging and eternal. There is no past no future but forever and always an eternal now. 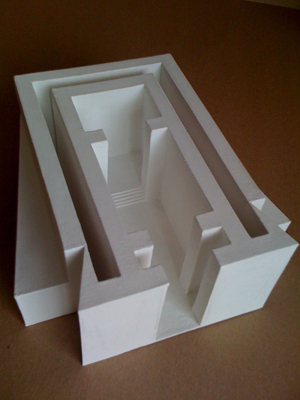 The sculpture is made of humble materials providing only a framework to the space it occupies. 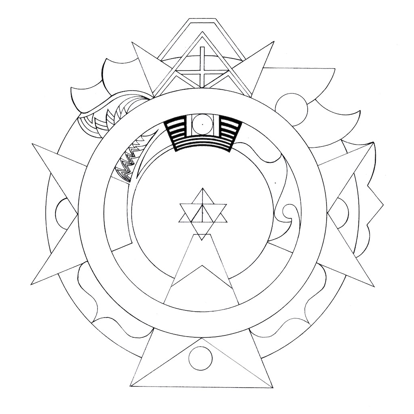 The purpose is to illustrate the tridimensional object so that the symbol can be observed spatially. 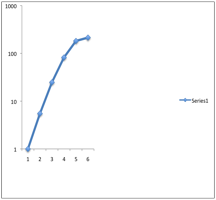 Mathematics are embedded in relation to the features and various other systems of proportion that are present. 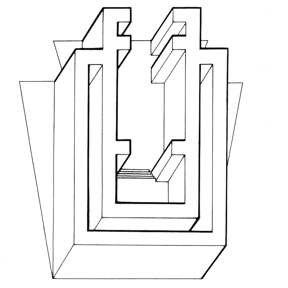 The golden mean or golden ratio is found extensively there are also hidden images that can only be seen if the sculpture is mirrored onto it self at key points as marked on the sculpture it self. Only a select group of symbols will here be mentioned, as they are perhaps those of wider interest. There is in literature what seems to me as a poetic interpretation of symbols that is merged with rather modern scientific advancements and personal also personal interpretations that in my opinion are detrimental if presented as anything other than a personal opinion or point of view as I make mention here. It is for that reason that I refer to the topic in question as poetic symbolism where the “O” sculpture is amongst other things a meditation on the subject. I believe the origin of the sculpture to be the result of a particular process that places me not as the artist that made another art work but in this case rather as a facilitator to the work which in actual reality felt as though it made it self. An image that is perhaps among the most predominant of those found in the “O” sculpture is that of the Snake eating its own tail or dragon or Ouroboros. 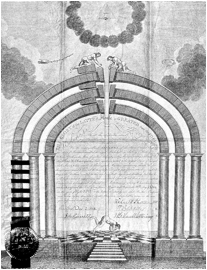 We see such snake in the collar of the 18th degree in the Scottish Rite. 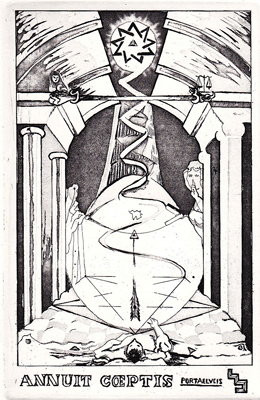 We also see it in the Orphic egg were the serpent represents the mysteries. “The Mithraics used the serpent as an emblem of Ahriman, the Spirit of Evil, and water. 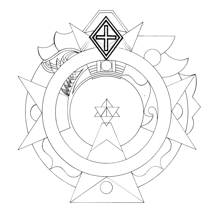 We also see it as part of the emblem of the Theosophical society. 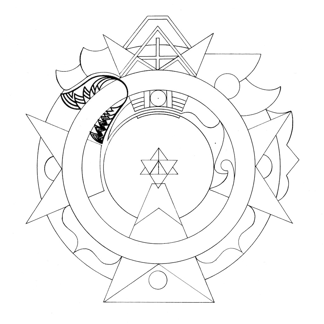 It is also found in as the Ouroboros from Alexandrian Egypt “All is one”. 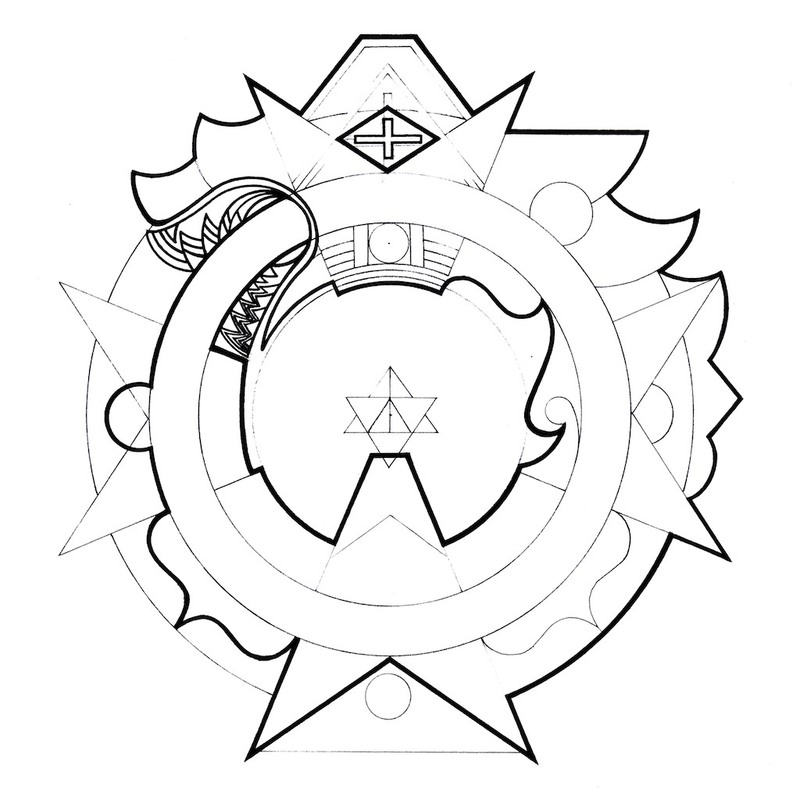 The Chinese Ouroboros from the Chou dynasty 1200 BC and surrounding double triangle of Solomon. 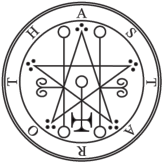 Astaroth who teaches liberal arts is shown as having jet black eyes a crown holding a serpent and is riding a dragon. Plato described the first thing in the universe as a self eating circular animal. 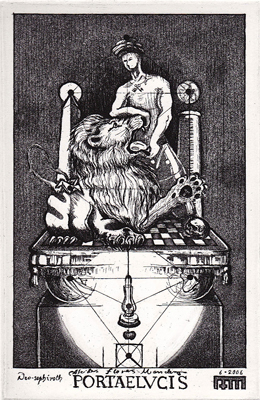 Asmodeus was called God of the circle and was depicted with the head of a lion human and bull. The serpent in Mayan mythology was a symbol of the cycles of birth and rebirth, which celestial bodies went though. Trough Mesoamerica the feathered snake, Quetzalcoatl is well known for its many legends. 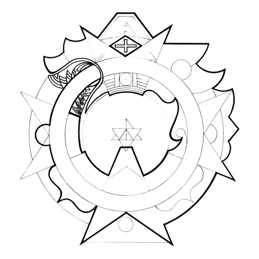 The Ouroboros was used in alchemy as a symbol of eternal cycles, hermeticism, unity and reflection. To Australian aboriginals the Rainbow Serpent is portrayed in many stories in relation to the sun, water and land. 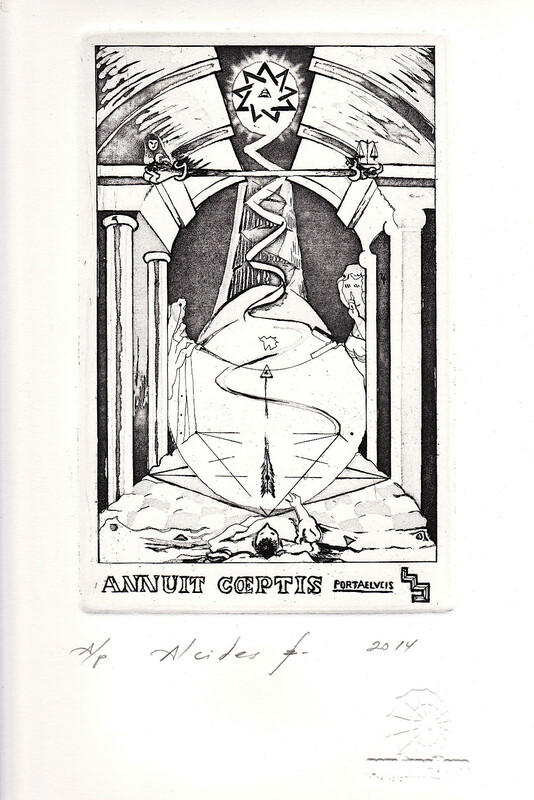 The caduceus, the wand of Hermes has two entwined serpents as in a double helix. Mayan and Aztec cultures played a ballgame perhaps a metaphor as to the movement of their ruling astral bodies and to the cycles of life in general. 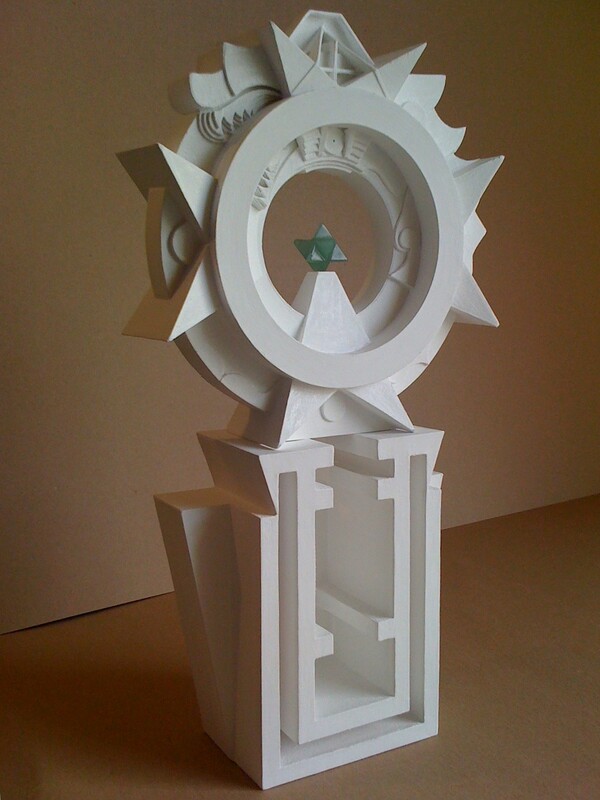 The O sculpture among other things is, a ring for Mayan games; games of illusion. The word Maya is alleged to mean illusion, we are born into illusion; what we know as reality is nothing but a deception. Thus what we think is missing is the thing that is real. 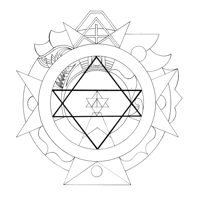 Pay attention to the thing that is not shown or missing, as that is the actual thing that is mentioned, it is an illustration of polarities. Lets think of light in terms of knowledge and understanding of nature and that, which illuminates all that we do. The pursuit of knowledge is the search for light. It is also very much in human nature to create meaning, where there is none. Perhaps the trademark of intelligence is to do so. It is human nature to be playful, with nature, its elements and our ideas of both. 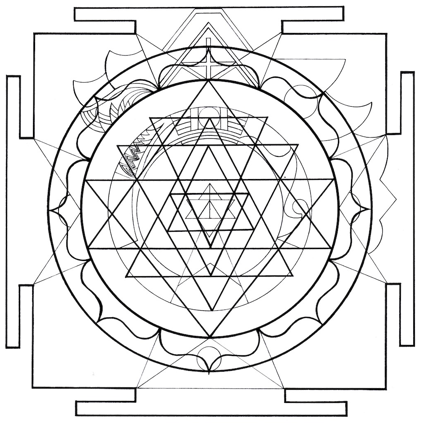 Also lets imagine there is a structure to it and that structure is mathematics and geometry at its core. 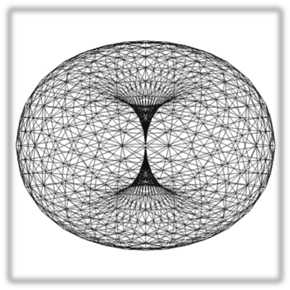 The Torus is a very particular shape of various meanings here we could see it as the circular perimeter of a point writhing a circle and part of the body of the snake. There is of course much more to it than that. The circles found in the “O” sculpture are placed following a mathematical relation to each other that sees them starting at a zero and returning back to a zero. 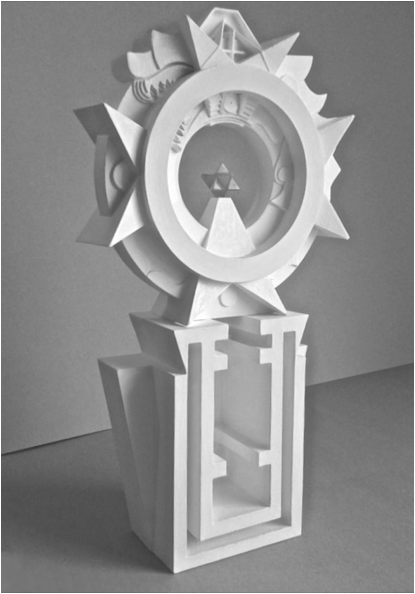 The Pleroma within the sculpture holds various other elements such as the square triangles, the five-pointed star etc. It also sections other elements within the sculpture. Here It would suffice to only make motion of the illustration rather than its particular contents and relations for now. 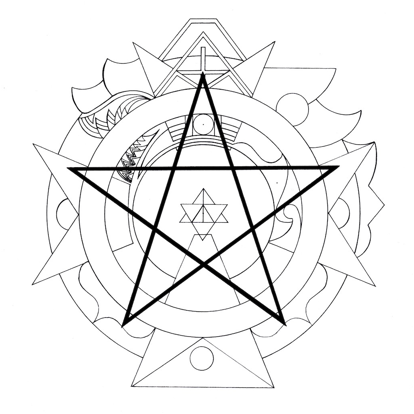 The Unicursal Hexagram, a six pointed star made by one single continuous line. Where the points would touch a circle surrounding it and two circles of equal diameter touching in the center would intersect where the lateral meet. 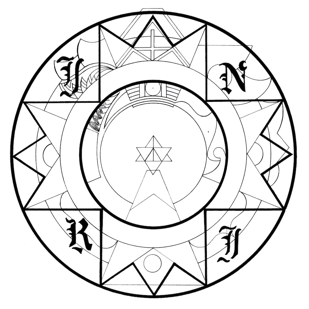 The Unicursal Hexagram symbolized the solar system and a higher level of consciousness that eventually elevates the individual to that of a supreme being. 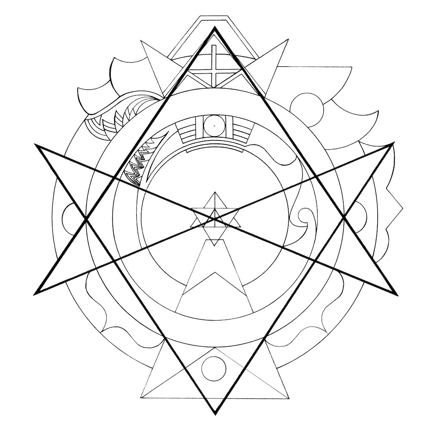 For the cabbalists it is an element in sacred geometry, the merkabah in the solfeggio cube. 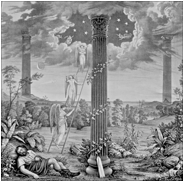 The Solstices and Equinoxes are marked by a cross that points their location in relation to the sun were the seasons change as the celestial cycles are being fulfilled as they have trough antiquity and a common representation of the cross. A cross as made by Neanderthal men over 70,000 years ago. 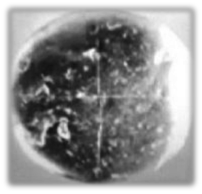 The Tata pebble is the oldest image known. It predates any other artwork by 35,000 years. We could be safe to assume that the cross is one of the most ancient symbols. The interpretation of Neanderthal man may never be known but that particular symbol has captured the imagination of many for a very long time. 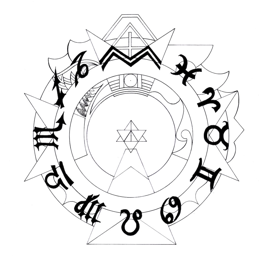 The zodiac can be seen by a very subtle double line at the head and bellow the eye were the head of the snake is Aquarius the new ruling constellation coming into place flowing Pisces. 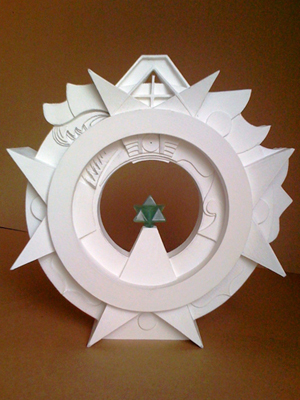 The eye as shown in the sculpture upright and sideways is as the emblem on the jewel of the Rosicrucian society. 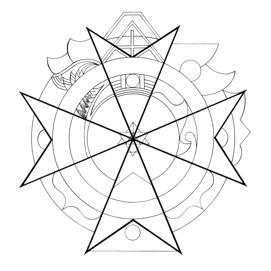 A Cross made by par of two intersecting Unicursal Hexagrams forming the Maltese cross. 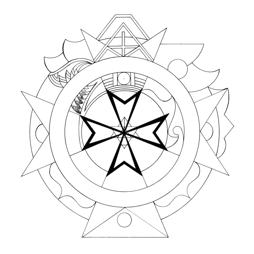 The cross use by the Knights of Malta it has being said to have eight points that refer to Loyalty, Piety, Generosity, Bravery, Glory and Honor, Contempt of death, Helpfulness towards the poor and sick and Observance of the faith. The cross perhaps deals primarily with being hospitable towards others. The ideal of such conduct may help shape the character of individuals to be of greater service to themselves and others. Symbols of earth can also be ‘the globus cruciger’ a symbol of power; placed trough the head of the snake looking at the rejuvenation of earth, reason and nature. 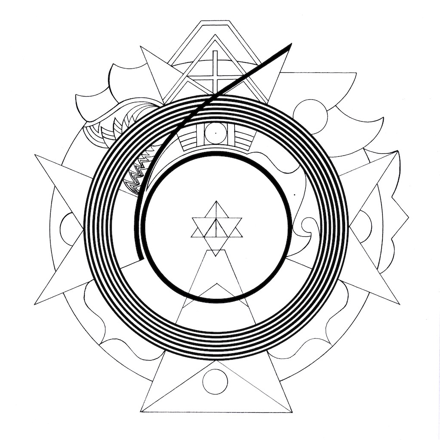 The circles as that refer to ages with an emblematic circle. 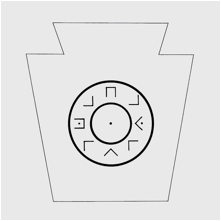 Here there is a number six that runs through the sculpture, as would a spiral the circles are not shown but rather a flat surface is in place with a very subtle number formed as going trough the jaw. 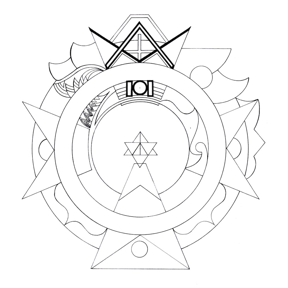 Reference to the circles is made in the 18th degree of the A. 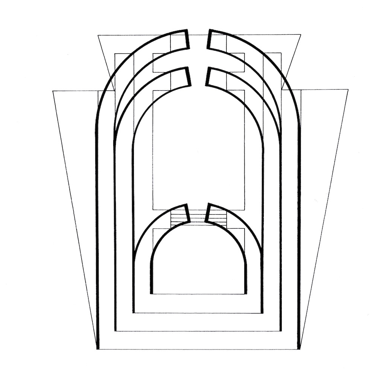 A. S. R.
In the middle of the ladder is a point within a circle; the circle is between two pillars. 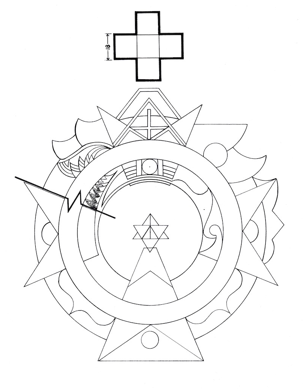 Above is the formation of a square and compass. The teeth on the snake are 33 and in sets of 13 on top and 20 bellow. Were the mandible is a circular form which in conjunction with the opposite circle behind the head loosely coincide with the two circular forms in the Pleroma. 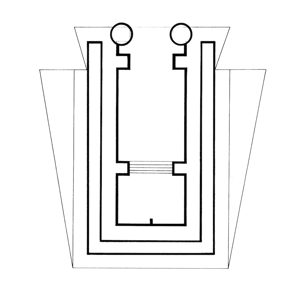 There is a set of 3 pyramids one on top of anther with corresponding chief cornerstones that are hollowed on the second and cut out on the third at the apex of the head. 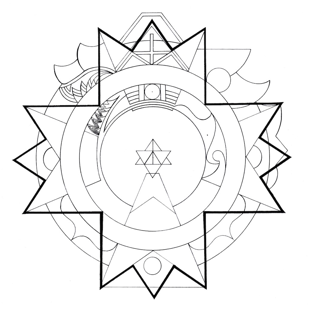 Helena Petrovna Blavatsky, "The Secret Doctrine", pg 171, 225, 255 (volume II). 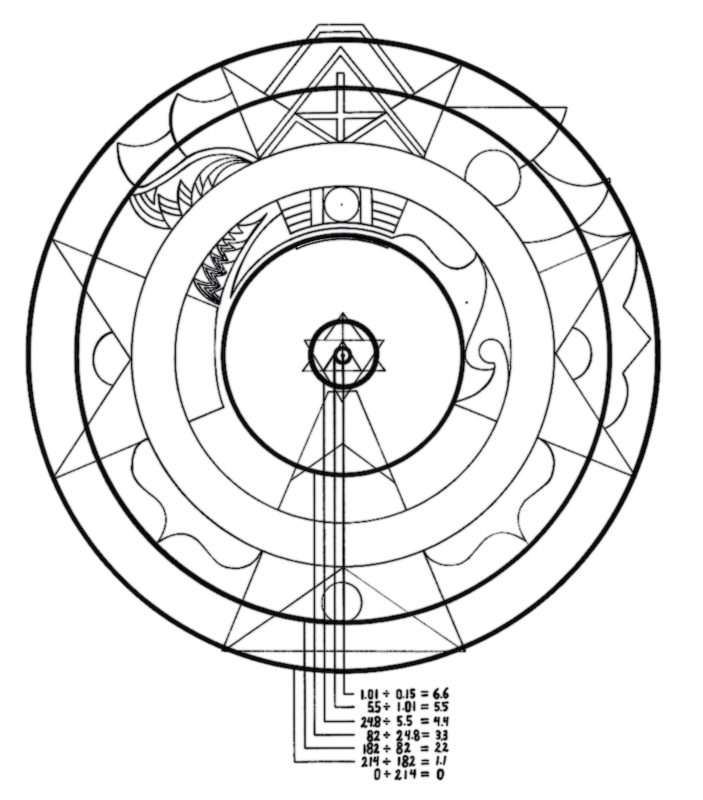 ELIPHAS LEVI," (LA CLEF DES GRANDS MYSTERES) THE KEY OF THE MYSTERIES ACCORDING TO ENOCH, ABRAHAM, HERMES TRISMEGISTES AND SOLOMON" pg 38, PDF Key_Mysteries.